Over the past two years, we've seen boutiques start to really stratify and carve out their own territory and turf. Puget Systems had their carved out pretty much since I started working for AnandTech, though: they're not quite as expensive as Falcon Northwest, but they definitely charge a premium over other boutiques. In exchange, you get hardware that's been carefully selected to be as reliable as possible. I've discussed their reliability metrics at length with their CEO, Jon Bach, and they're thorough to say the least, often singling out individual production runs as being problematic. The result is that the component selection they offer is much narrower than you might find at other boutiques, but essentially geared towards ensuring you never have to send your system in for service. That's especially important when you're dealing with a professional grade workstation. While I've typically been impressed by the quality of the towers Puget Systems has sent me, workstations from boutiques are another matter entirely. 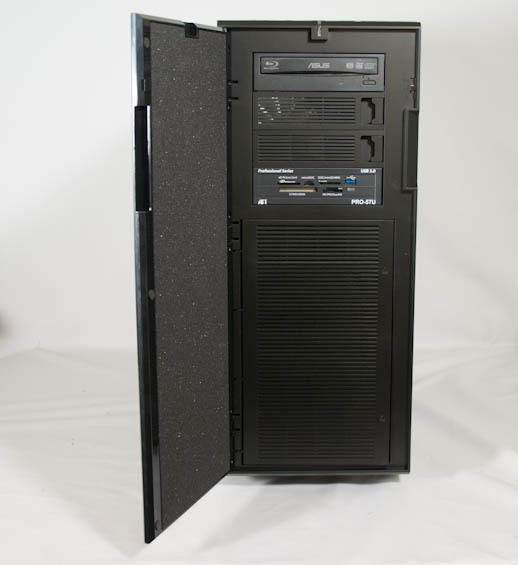 It's my understanding workstations are responsible for a healthy amount of business for boutiques, but while a boutique tower is almost always going to be a better long term deal than buying a conventional tower from a mainstream vendor, workstations have greater expectations placed on them. They need to be more reliable, and quality of service and customer care is a serious issue. Without the infrastructure of a Dell or an HP, service becomes a real fly in the ointment, and every other part of the experience has to be good enough to make up for this. Though Puget Systems is no stranger to workstations, the build we have on hand today had a journey to fruition that I'd like to think I had some small part in. The Puget Serenity is a dead silent but very powerful tower, and Mr. Bach and I had gone back and forth about designing the quietest full fat workstation we could. In the interim I vanished under a sea of work, but the concept turned into a product in my absence. Today I'm reviewing that product: the Genesis II Quiet. Dimensions 9.13" x 22.01" x 22.04"
Obviously a dual-octalcore workstation is not for the faint of heart or bank account. The Genesis II Quiet is a strictly dual-CPU affair, and the dual Sandy Bridge-EP Intel Xeons in our review unit are the fastest Puget Systems is willing to offer: two Xeon E5-2670s, eight cores apiece clocking at a nominal 2.6GHz but able to turbo up to 3GHz on eight or seven cores, 3.1GHz on five or six cores, 3.2GHz on three or four cores, and 3.3GHz on one or two cores. These clocks would ordinarily be unimpressive on a quad core, but we're dealing with a tremendous amount of threaded performance here (32 logical threads in all), and all of this performance is under a TDP of 115 watts. That means that before we get to anything else, we're looking at 230W of CPU horsepower alone. Each socket only has four memory slots to populate all four memory channels, and our review unit is running 32GB of Kingston ECC DDR3-1600 per socket. 128GB and 256GB configurations are available, but they're not cheap by any stretch of the imagination owing to their extremely high density DIMMs. Meanwhile, system storage is handled by a capable Samsung 840 Pro SSD (256GB) while mass storage is handled by the slow but low-power Western Digital Caviar Green (3TB). There are a trio of decisions that I think are worth mentioning. Up until this point, nothing's been too out of the ordinary for a workstation. The first is Puget Systems opting to use a Fractal Design Define XL R2 for the chassis. I reviewed this case fairly recently and I think it's a good fit, but as far back as I can remember Puget Systems has been a predominately Antec house. 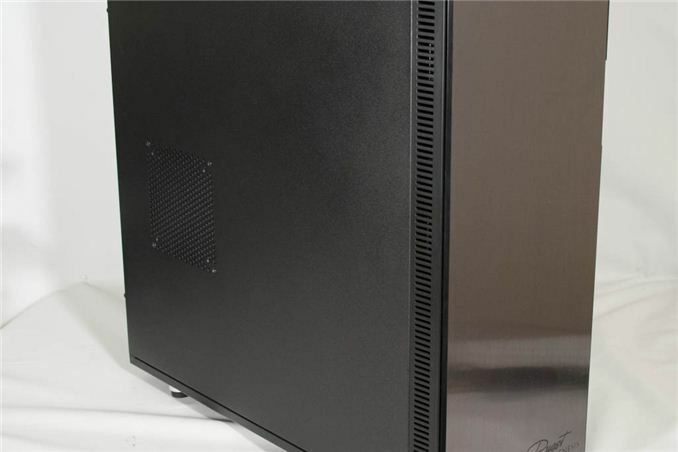 Yet for dual-CPU systems, Puget is going with the Define XL R2, pointing to both a hole in Antec's lineup and potentially the greater fact that Antec has been extremely sluggish in addressing the chassis market it used to lead. In a way, this feels like a subtle indicator of something we may already have known: the Fractal Design Define line of cases is essentially the successor to the P180 series legacy. The second are the pair of Gelid Tranquilo v2 coolers used for the CPUs, undoubtedly to substantially reduce noise over Intel stock cooling. Since these tower coolers are capable of dissipating much more heat than they're going to get from the Xeons, Puget Systems is able to run their fans at very low speeds, keeping the processors cool without generating noise. There's no liquid cooling at all in the Genesis II Quiet: while liquid cooling can be excellent for hitting low noise levels, true silent running is really only achievable with air cooling. Additionally, air coolers are going to be more reliable long term than a liquid cooling loop and require less service. It's a win-win. Finally, while the ASUS GeForce GTX 670 is certainly a very quiet card, it's also an extremely oddball choice for a workstation. If we were looking for pure compute performance at a low price tag, an AMD Radeon HD 7900 series would be a better choice; for genuine workstation tasks, consumer-grade GPUs are out of the question. This will unfortunately put a nasty damper on the Genesis II Quiet's performance later on. Note that you can configure the Genesis II Quiet with proper workstation cards, and naturally they're pretty expensive. Care to test an incredible workstation? Try one of the overclocked systems from Boxx Technologies.like their 4920 Xtreme or one of their 4+GHZ dual Xeon systems. We are using the 4920 Xtreme systems for Autodesk Revit / 3Ds Max at a medium-sized architectural firm and it absolutely screams, and it better for $8K. Coming from hexcore Xeon Z800 systems....staggering difference. Really now? I just went to their website, and for a computer with the exact same configuration as the product being reviewed here would cost $10,000. And that wouldn't even be for a super quiet computer, so I fail to see how that would be a better computer. Yes they are overclocking the Xeons to a mild degree. Whether it's a good idea or not, they've been doing it for a long time. I doubt they would have the client list they do if these machines were not reliable. I suppose this board won't support full AMT 7.1, due to the wrong LAN chipsets being used? im sure you could build for cheaper, 6000+ (when you add the extras) for something special.